In order to focus we need to let go of the past and do not live in the future by too much planning. 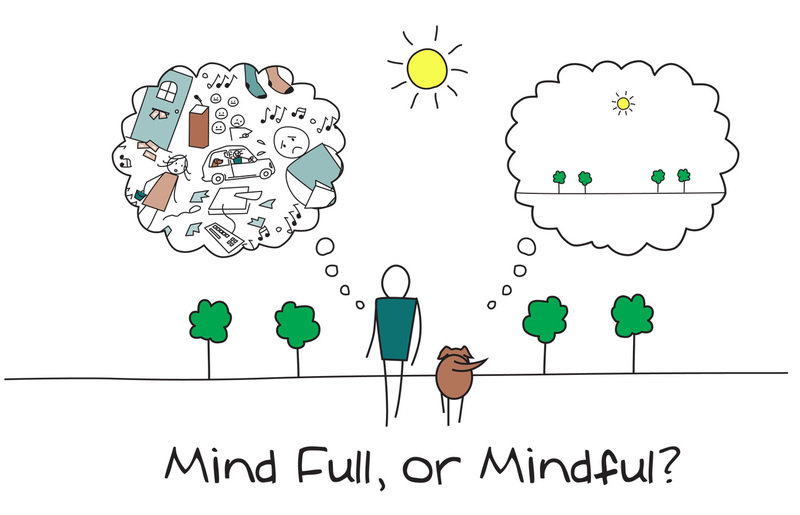 Becoming mindful means: being completely present in the moment. In this post I am going to show how we could achieve a calm mind and, therefore, are able to focus on the present. Have you been experiencing trouble to focus on completing a task? Do you have problems listening to your counterpart, taking in all the information? Are you facing an overload of information in our digital world? Are so many thoughts popping up in your head that you cannot relax and find peace? In the following I will present some techniques that will help achieving mindfulness to calm our minds. But first let’s look at what is actually happening in our heads. Thoughts are psychological constructs created by our minds. These are ideas, resulting from a set of impressions that some mental ability exists as an entity; like memory, language and emotion. In other words, it is just an artificial construct which makes us believe that it is created form a real place. What can be really troubling and lead to re-appearing thoughts is when we have unsolved issues from the past. They will haunt us forever, unless we decide to face our problems and deal with them. This can be quite daring sometimes, depending on the issue, but it is the straightest way. Making sense of dramatic events or emotions from the past can reveal the emotions involved. This is why we often avoid turning towards our problems. We think it is easier to suppress them. This is the way of least resistance. Surely it might work for a while, but on a long-term perspective it does not solve the problem. What we often forget is that it costs more energy to suppress the issue over time, then facing it one time and solving it forever. In addition, there will always the feeling of not being completely happy, or in this case have peace of mind. Let the past be the past. We need to accept that some people do not stay forever in our lives for example. Every single person is on their own path. Sometimes their paths cross with our own ones. Then we have an unforgettable time or working on a project together. Sometimes friendships and lasting connections develop. But even if the encounter is just for a short time, maybe a blink of an eyelash, does it not matter how we interact with that person? At some point, these paths separate again. Perspectives and life goals change, so that we realize that we have to go different ways. We should keep the memories and remember the good times. We should not let our impact in the future be limited by the baggage of the past. Speaking of future, we sometimes overestimate the things we can plan and forecast. Even though we recognizes the importance of setting goals and having a clear vision of the future, we cannot control every potential outcome. There sure is a time for planning and reflection, but once a direction is set we need to let go the goal. We need to have trust and faith that we are going into the right direction. We need to believe that our actions in the present will improve our future. Only then we can focus on our actions in the here and now. It’s a simple equation; the more information we are exposed to, the more we have to digest. In a world which seems to turn faster every second, with increased globalization and competition, as well as the internet, which gives us access to endless knowledge and data, it seems to become more difficult to not get engaged in the ongoing rat race. But isn’t going offline from time to time helpful to get some rest? Avoid reading the news, which seems to be plastered with negative stories. The most important news will reach us anyway. Turn of the TV from time to time and stop scrolling down the never ending timeline of social networks. Dave Crenshaw has pointed out in his book ‘The myth of Multitasking’ that multitasking is not possible. Instead we are switching back and forth between the tasks at hand. This requires extra effort and energy, which could be better invested in focusing on completing one task at a time. In addition, there are distractions which lead to interrupting our work. These could be external ones like background noise or internal distractions in the form of mind wandering. Getting back to the initial task requires not only energy, but also additional effort to get into a state of flow again. Moreover, there is the risk of losing a thought. Maybe we recognize ourselves in the following scenario. We get up to get something from the fridge, open the door and do not know why we got to the fridge in the first place. The thought is lost. First, do the multitasking approach. Stop the time you need for writing down in turn a letter and then a number, then again a letter and so on. Write the letters in one row and the numbers in another row below. Start with A and 1. Do this till you reach the letter Z and respectively the number 26. Now compare it to the time you need for the single task approach. Write down the alphabet first in a row and then the numbers 1 to 26 below the letters. On average the time needed for the multitasking approach is twice the time for the single task approach. One could argue that numbers and letters are so familiar to us and that this experiment is not an appropriate multitasking situation. I recognized these arguments as well. Therefore, try this more advanced multitasking test from Lab in the wild. It will reveal similar results. We complain about not having enough time, but spent on average almost four hours every day in front of the TV? I am highly advocating enough time for leisure activities, so that we could get our creativity going, but spending it in front of the TV? Take a moment to reflect on what we could do in all that time. And I am not even talking about producing something of value, but just spending time with our loved ones, like meeting friends, playing with the children or having a nice talk over dinner with the neighbor. Focusing on the activities we really value and which give us joy is also a way of getting more focused. Clifford Nass spots some light on the damage of multitasking and overusing technology instead of enjoying the emotions from face-to-face interaction. And please let me know if you have figured out what he wears on his tie. A very practical tool for keeping our ideas is a journal. Sometimes it can be helpful to just write down an idea, an upcoming task or keeping track of our appointments. This will empty our head and gives us more space to focus on the important thoughts. I am using a special journal for this, which so far is unfortunately only available in German. The Hallo Klarheit journal is not only a week planer, but also has a life coaching part. But I also use a simple journal for my business ideas. I find it useful to write down an idea or thought to elaborate on it further later on. That way it has time to develop. This is how the HumanBusiness blog was created and you are reading the result of my thoughts right now. Mindfulness means that our mind is empty of distractions. Then we are able to completely focus on the task at hand. In order to master the skill of mindfulness meditation is helpful. The probably most famous advocate of meditation is the Dalai Lama, who practices meditation and mindfulness for about four hours every day. In that way he makes sure that he has a clear mind and can focus on his tasks. Meditation originates from the latin verb ‘meditari’ which translates ‘to think or ponder’. It seems like meditation is experiencing a new hype recently, but Matt Rossano even argues that meditating has made us human. During meditation we are left alone with our thoughts. As with every new skill, meditation takes time to master. So it might be wise to not expect immediate results. Probably the easiest way to start is to sit in a non-distractive environment and relax. Closing our eyes to concentrate only on our breath. Feel how we calm down and our breath becomes steady. Once we are calm, we start feeling the ground we are sitting on; realizing the surface it has. Try to experience it will all our senses. In that way we are becoming present for the moment and are engaging with our surroundings. For the ones who are new to meditation, there is an app called Headspace, which I believe to be very helpful. Plus it can be tested for free. Who would not want to achieve this state of flow and to be fully present when doing a specific task? In what situations have you reached a state of flow? Rossano, M. J. (2007) Did meditating make us human? Cambridge Archaeological Journal 17:1, 47–58.